Fun facts about Otto Raths, professor of physics, who is retiring this year: He has been a part of more than half of Wagner’s 100-year history on Grymes Hill. 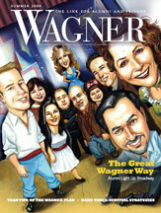 Eighty-five percent of Wagner’s living alumni have overlapped with his tenure. When Raths first came to teach at Wagner, in the fall of 1964, things were different than today. The dress code, for example, required male faculty to wear ties and jackets. (Raths says he took his off as soon as he got to his classroom.) Football games were played behind Main Hall. There was no Union, no Harborview, and no science building. There were 2,197 students, however, who needed instructors. Raths had a friend, Harvey Logan, who taught physics at Wagner. He connected Raths with Wagner when Raths had grown dissatisfied with his job in industry. Dressed in jacket and tie, Otto Raths and Dennis McDonald from the 1965 Kallista. 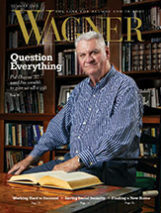 In 1968, Raths left Wagner for a couple of years to complete his Ph.D. at the Stevens Institute of Technology; but he had found his niche, and he returned to influence generations of Wagner students. Not only serious students of physics and math have loved him, but also students in all majors who took his classes in entry-level science. He will continue to do so, as he intends to keep coming back to his office in Megerle 112 (he's officially on sabbatical for 2018–19) — or whenever his wife, biology professor Linda Raths, needs a ride to work. He’s made himself available as a tutor and substitute lecturer. Also retiring this year are Marilyn Kiss, professor of Spanish since 1989; and Miles Groth, professor of psychology since 1994. Marilyn Kiss, professor of Spanish. Kiss’s joy in Spanish language, literature, and culture has been her gift to Wagner students. Her pedagogical skills earned widespread recognition, most recently by the Metropolitan New York Chapter of the American Association of Teachers of Spanish and Portuguese, who named her Teacher of the Year for 2018. She also served as Wagner’s study abroad advisor for 17 years. In retirement, she plans to continue her passions for poetry, photography, and reading. She also wants to travel to Hawaii and Alaska — the only two U.S. states she has not yet visited. A psychoanalyst as well as a prolific scholar, Groth is well-known for his focus on the psychology of men and boys. With a grant from the Lilly Endowment, he started the Wagner College Men’s Project, which continued as a research center. He is the editor of the journal New Male Studies. Groth directed Wagner’s Honors Program for eight years, leading five study abroad trips to Venice. 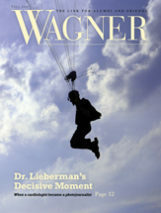 In his retirement, he is co-authoring a book called (Human) Psychology (Rowman & Littlefield/Lexington, 2019), speaking internationally on psychotherapy, as well as playing the piano. Jan 22, 2019 It takes an unusual degree of dedication to offer a First-Year Learning Community. 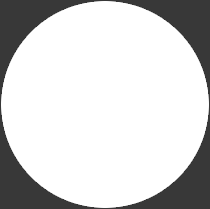 Jan 11, 2019 There was only one thing I wanted to do with my life, and now it was gone.